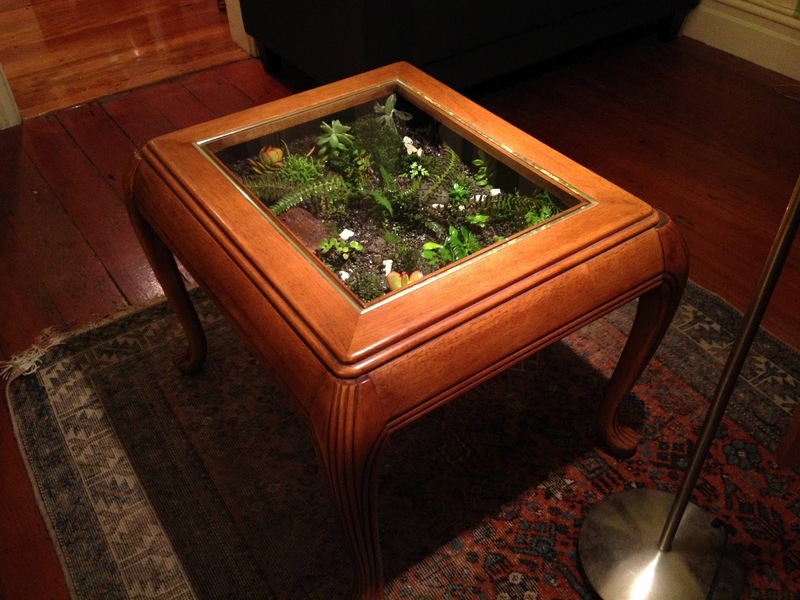 The coffee table is second hand and I attached a sheet of ply to the bottle, lined it with polythene and laid down soil, placed the main ferns, then moss and then placed in the succulent cuttings and rocks and then added small river gravel. The glass comes off for maintenance. Wow - love it! So creative, and really beautiful. awwwwsum!!!! JUST WHAT I WANT TO DO WITH ONE I GOT AT A YARD SALE. IF YOU WOULD LET ME ME KNOW WHAT YOU FOUND WERE THE BEST PLANTS FOR A SHALLOW ONE. > "I attached a sheet of ply to the bottle"
I'd love to make this myself, but don't understand Chris' instructions at all... Has anyone made a coffee table into a terrarium? Can anyone provide stepby-step..? Maybe he meant "bottom" not bottle?